Bobbie (Bob) Neal Fravell went home to be with his Lord and Savior on Saturday morning, January 19th while in West Florida Hospital. Bob was born to the late Roy and Ruby Fravell on 16 March 1935 in West Frankfort, IL. He was married to Jearren Fravell (Jan) who preceded him in death, they leave behind two children and five grandchildren. Bob was one of 18 children born to his parents and is survived by three remaining brothers. Bob retired from the United States Army after 27 years of Active Service and 4 in the Army Reserves. He moved to Pensacola in January 1984 with his wife Jan and their two sons, Charles (married to Young Bae) and Michael, (married to Katie). Jan and the boys went with him on all his overseas tours except for Viet Nam. Bob served in the 326th Medical Battalion in Viet Nam and was a proud member of the Eagle Dustoff. 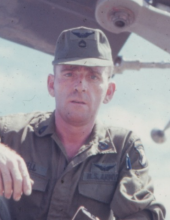 He was awarded the Bronze Star, Air Medal, the Combat Medical Badge, the Aircraft Crew Members Badge and many other awards and decorations, he retired as a First Sergeant. After his service in the US Army, Bob worked for the US Postal Service in Pensacola. Funeral services will be held at 12:15 PM, with visitation from 11:15 - 12:15, on Monday January 28th, 2019, at Faith Chapel Funeral Home South with Rev. Jerry Passmore officiating. Bob will be laid to rest at Barrancas National Cemetery with his loving wife Jan. Flowers are appreciated, but in lieu of flowers, donations to St. Jude’s Children’s Hospital in Bob’s name would also be appreciated. To send flowers or a remembrance gift to the family of Bobbie Neal Fravell, please visit our Tribute Store. "Email Address" would like to share the life celebration of Bobbie Neal Fravell. Click on the "link" to go to share a favorite memory or leave a condolence message for the family.